One of the industries to see an upward boom in the recent years is the travel industry. And why not! There are lots of reasons giving a leg up to this industry and making it easier for people across the world to travel for business and for leisure. Why Travel Industry is on the Boom? Did you know that international travelers are expected to double by 2020 to almost 1.6 billion? The growth of the travel industry in the new markets of China, India, South-East Asia, MENA and Eastern Europe is staggering. The travel and tourism industry in the MENA (the Middle East and North Africa) region alone is expected to reach $350 billion by 2027 according to Mena Research Partners. Right now, KSA and UAE make up 50% of the MENA travel market. Quicker air travels have made remote areas more accessible. More paid holidays let people have frequent smaller vacations than a single big one. An increase in the amount of disposable income and awareness of the attractions-thanks to the internet-means that people are aware of the travel experience out there and can afford it. Cheaper online bookings and advertising by travel agencies of low-cost travel packages attract the customers to travel more frequently. The extensive use of the internet has changed the travel industry’s fundamental structure. Travelers of MENA region book half their trips online. 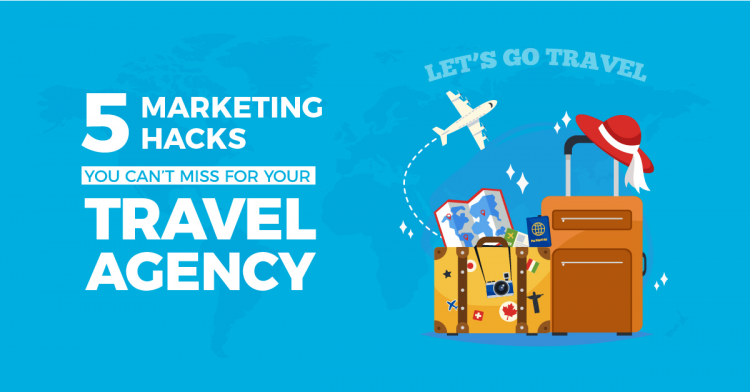 If you’re looking to plunge into this industry with your own travel agency and market yourself, there are 5 powerful strategies and hacks you can adopt to make your venture very successful. Each month there are millions of people who use search engines with travel keywords. A staggering 33 million people made searches for online airline reservations and tickets. 16-29 million also searched for cheap vacation packages and hotel reservations. 10-14 million searched for cruises and car rentals. 80% of these people bought what they were looking for online. How can you take advantage of this? Since travelers are planning far ahead, so should your travel agency. You can preplan your offers and travel packages depending on the yearly seasons in order to appeal to those searching online to book their travels long before and at the last minute. More than 2/3rd of the internet users search about traveling in their own languages. If your website is in a single language, you are missing out on a larger chunk of the travel pie. What can you do? Partner with a professional translation agency to translate and localize your website and applications. Torjoman is a valued translation agency with a huge travel and tourism team of professional translators. Torjoman can localize and translate your website to suit the target country while taking care of the cultural nuances and differences so that you win each time a user logs onto your website. From language, symbol, pictorial information to visuals – Torjoman can localize and translate all content for multiple platforms for your travel agency to put you in the forerunners of the industry. It would be fantastic to have a customer come online, do a search on travel, see your paid search ad and convert immediately. But today’s customer journey is more complex than that. And you need to be a part of it in each step. According to Google, there are four moments where you should strive to win your travelers over. When potential travelers are thinking about traveling and do searches to find inspiration and ideas like where to go and what to do. Your website must have helpful content already in place. When they are in deep consideration mode and are searching about airlines and hotels based on timing, location and cost. Your paid ads, reviews and website must address this segment of the target market. When they have made their decision and are ready to make their reservations. You must have packages to suit their needs. When people are searching about what to do or where to visit nearby during their trip. Giving a holistic support and experience to customers in all moments of the customer journey is important to make a lasting impression. One way to harvest an existing demand is to go for search ads. But if you are proactive and want to “create” a new demand then social media Ads are what you must focus on. Your agency and brand can promote inspirational and memorable content that is designed with your own target audience in mind. People will see that social media ad and it will stay in their recall memory. Social media is a great way to generate brand affinity. Continuously generating useful and helpful content for travelers is a sure way to stay on top of their minds. You can also create online communities and a large following that you can interact with directly across all social media channels. No matter which hacks you go with, Torjoman can become your translation partner to ensure your message is received by a wider set of audience across borders.